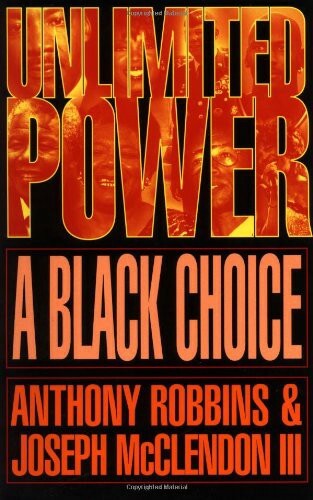 Anthony “Tony” Robbins and Joseph McClendon III jointly authored a self help book titled “Unlimited Power: A Black Choice”. The Robbins-McClendon collaboration was published 1997, i.e. pre-Obama. Now that America has made a choice and elected an African-American as POTUS, this self help book could serve as an U.S. historical perspective. Ever hear of Tony Robbins? He’s an excellent motivational speaker and author of several bestselling books on how to forge your path to success. My son appears to be a huge fan. He’s always quoting him. This article is about one of the books found in my son’s personal library, which is now in my possession because when he moved out it was left in a box in the garage. No I won’t be taking it to the Antiques Roadshow for appraisal. Instead I’m giving it my own appraisal and sharing my valuation. Tony or Anthony Robbins co-authored this book with a friend and fellow professional, Joseph McClendon III. Both of these guys have unquestionable credentials. If you want to know what makes them think that they know enough to tell you anything, just flip to the pages at the end entitled “About the Authors”. Also an important note to mention is that Mr. Robbins is a philanthropist and in addition to operating his own non-profit organization, ten per cent of the royalties from the sales of this co-authored work are donated to the Young Black College Fund for the mentoring of young African-Americans. The book is called: “Unlimited Power: A Black Choice”. There are several reasons why a person, regardless of their background, would probably like this book. For one thing, it has great quotes woven into the chapters from celebrities like Quincy Jones and Oprah Winfrey; and historical Americans like Sojourner Truth and Booker T. Washington. There are also quotations from two people whose sayings appear in writings by almost everybody: Unknown and Anonymous. You might be tempted to just skim through the leaves looking for all the “Who said what” remarks. Another reason? Quickly peruse the Table of Contents and your curiosity will be aroused. Although you may say to yourself that there is no new thing for you to learn, you might convince yourself that it’s worth further examination. For example, “Mastering Your Mind: How to Run Your Brain”. Sounds fascinating! I must figure out how to do this because my brain always runs away from me! Or how about this interesting title: “The Difference That Makes the Difference”. Hmm? What difference could that be? In all, the book is very good motivational reading. Although, to be honest, the basics of how to develop a spirit and mindset to achieve unlimited success is something that surely every human being must already know, instinctively or intuitively. (1) Don’t lie. (2) Don’t cheat. (3) Don’t steal. These are not optional. They are commandments. (1) Don’t whine. (2) Don’t complain. (3) Don’t make excuses. Well thanks a lot, Joe and Tony! Now what am I supposed to use for hindrances to slow me down and stop me?! The basics aside, there is some awfully good information and advice which can be extracted and learned: memory management; the precision model; healthy eating tips (food is fuel); and various motivation strategies. The insertion and application of the Peanuts® comic strip is priceless. One final reason one might consider reading or reviewing this Robbins-McClendon collaborative effort? It is 2014. America made a choice and elected an African-American who is now serving his second term as President of the United States. This book was published pre-Obama in 1997. I think it would be a good read for a U.S. historical perspective. Originally published at Writedge on March 23, 2014. Content contains Amazon affiliate link.